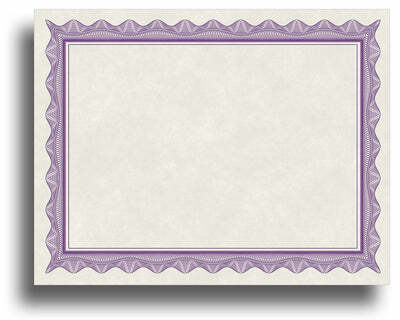 Interior Blank Space - 8 7/8" x 6 1/4"
Desktop Publishing Supplies brand Blank Parchment Certificate Paper with Purple Border is the top choice by professionals for creating award certificates. This certificate paper is great for honoring achievement, excellence, and contributions. Not only does it feature a beautiful, yet classic design, it is also created on a premium stock, measures a standard size, and works in all printers! These parchment certificates are made from an 80lb text (120 gsm) paper stock. This puts it 33% thicker than the average certificate stock weight of (60lb text). Plus, the parchment style look is on both sides of the paper for a more natural appearance. Finally, this product is fully compatible with all printer types (inkjets, lasers, copiers). 100% Made here in the USA! Your search for the perfect certificate paper ends here.